It was a cheap $32 ring. Not my wedding band, or my grandmother’s diamond, or some sparkling honker of a gem from Tiffany’s. It wasn’t anything worth anything to anyone. Except to me. It was just a ring. That’s what I tried to tell myself. Except that it was more. To me, the ring was an engraved promise, and it was worship, and grace, and breath of God, and new life, and the deep, deep love of Christ for me, His beloved. It was Spirit, and it was Yahweh, and it was surviving what didn’t seem survivable when the steel of my own van came crashing in around me. It was my miracle, in etched silver. It was God, in an unbroken circle. It was Him and me, in this thing together — through thick and thin, for life and then some more after that. To me, this ring stood for forever. I had already planned that one of my girls would get that ring when I died. 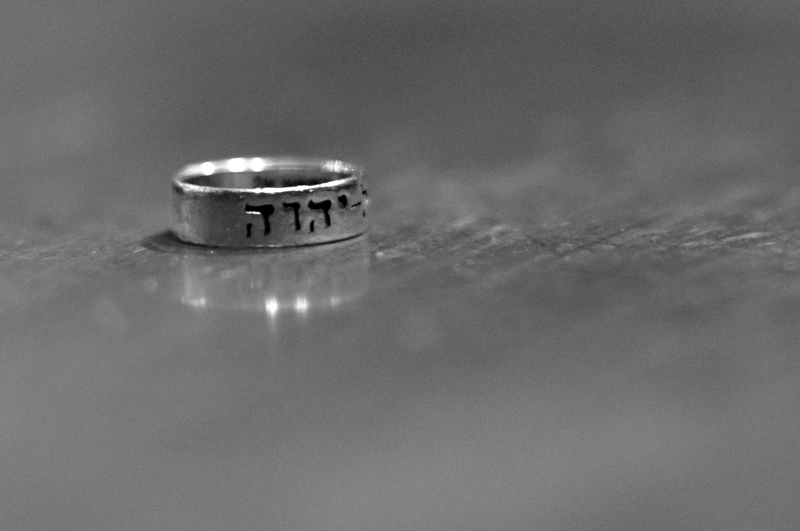 One girl could have the wedding band, and one could have the Yahweh ring etched with the Hebrew letters: YHVH. To me, both rings carried equal worth, despite the wide price difference. It was just a ring, a $32 ring. But it had this amazing back-story about how God changed a bunch of stuff. I didn’t know it was gone until I stood at the bathroom sink to wash my hands. I found a naked finger. My sister was here, and I called her to the bathroom. I just shook my head and showed her my empty finger. She knew why I hurt. She knew. “Do you want me to look for it? We could dig through the dirt?” And I know she would have, if I’d asked her to. That’s what sisters do. I shook my head again. No. It’s gone, the YHVH ring. It’s just … gone. 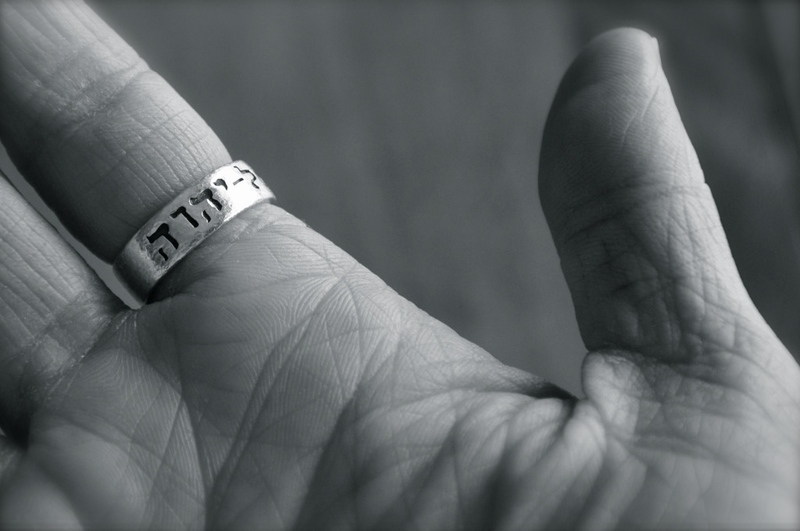 I wrote those words (up there) about that YHVH ring back in 2011, right here on this blog. More than three years have passed. It took me months to get used to the way my finger felt, unwrapped. I knew it was just a ring, but it was a trigger. A symbol. And the good Lord knows we need triggers and symbols. We know that God isn’t the ring. But the symbol is the trigger to remember the very present nature of our God. We see a cross; we think of Christ. We smell grape juice or wine; we remember how sweet the gift of forgiveness. The smell of wax, a sanctuary. A dove, His Holy Spirit. And without them? We feel the ache. I felt a serious. ache. Yesterday, I pulled old boxes from the storage room to toss old stuff that was taking up valuable space. I pawed through a box of old VBS supplies, and suddenly … a silver glint on the carpet. I knew it right away, when I saw the shine. I picked it up, and saw the Hebrew letters. It must have fallen into the VBS box back in 2011, not in the dirt! Yeah. I may have cried a little. And my daughters may have given me a bit of the side-eye, wondering what all the emotional fuss was about. I didn’t even care. I flat-out bawled. You know what I’ve been thinking? I’ve been the ring. I’ve felt a little lost from time to time, not sure where I fit. Not sure if I’ve been missed. Not sure if anyone cares that I am hanging out at the proverbial bottom of the box in some storeroom. His promise is still good. Yahweh is still unreasonably good. And He never, ever leaves us. He sees us at the bottom of the box. And He always pulls us out of it. Always. A #TellHisStory is any story that connects your story into the story of God. You’re invited to tell that story right here, in community with us. Share your narratives, your poems, your Instagrams tagged with #TellHisStory, … your beautiful hearts. You are the chroniclers, the people who help others make sense of the world with your words and your art. Story is how we know that, no matter what happens, we can get back up again. Visit someone (or two) in the link-up to encourage with a comment. Then, Tweet about your posts, and the posts you visit, with the #TellHisStory hashtag. Come back on Friday to visit our Featured #TellHisStory, in the sidebar. A final note: This is a safe place to tell your stories. You don’t have to be a professional writer to join us. Story is built into every single one of us. Your story matters, because it’s part of God’s story down through history, not because you punctuated everything correctly. Deal? For more details on the #TellHisStory linkup, click here. Share the love of story by visiting someone else in the community! Beautiful post! Thank you for this community! So happy you’re here, Sybil. I LOVE this story – such a reminder of God’s presence and that he knows our desires.. he knew how much that ring meant to you and the right time when you needed it back again. Thank you so much for sharing this encouraging story. Thank you, Devi. Such a joy to be “in community” with you here. That’s exactly how I’ve been feeling this year – I’m the ring! Even though I know God is with me, with my family, in this world…. I’ve been a little lost… God sees me/us at the bottom of the box; Thank you for sharing – We are never alone, right? I love it that in God’s economy, the lost get found. Amen? Thanks for being here, Janet. That ring was your GAKAT. And, He knew you had lost it, He knew where it was, and He knew that day you would find it – not in the dirt but preserved for THAT day. LOVE THIS STORY. As usual, this spoke to me. Thanks, Jennifer! I am so glad to hear that, Kim. Oh, how I loved this story! Such grace, and such a powerful truth. Thank you! I wrote a Five Minute Friday post in June about the time I lost an earring that my mom had given me .. Can definitely relate to that feeling! YAY! I love this. I would have flat out balled too! And oh I need this reminder too. God’s lost are sought and treasured. This is a beautiful story! I have a story of something lost. You inspired me to write about it! Stop it right now! I am in tears over the goodness and symbolism of your ring being lost and then found again. Praise to our God who sees never loses sight of us! Tears springing up in my eyes, knowing you “feel” what I’m feelin’. Grateful for you, Melinda. Thank you for sharing in the comments. 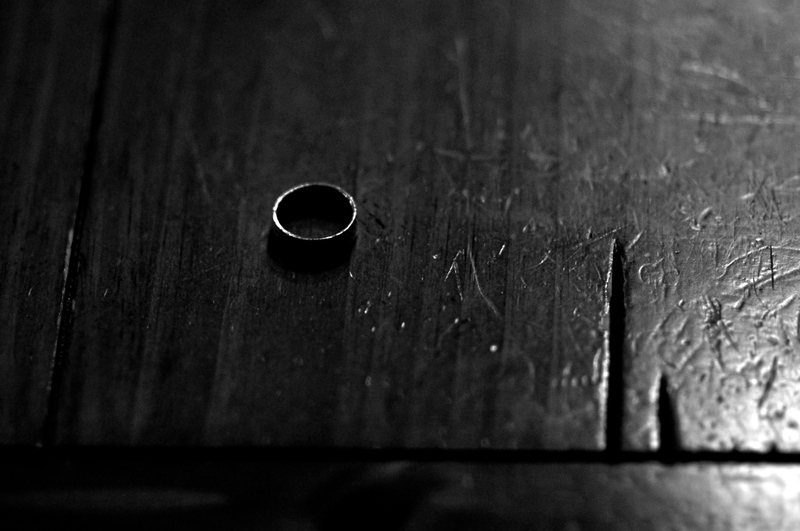 I think that finding that ring yesterday, perhaps carried more meaning than it would’ve all those years ago. Right when you needed to know He cares, He is with you, He knows all your hidden places and He loves you with His perfect timing. Love this and you! So true. Thank you, Shelly. I love that you found your ring, Jennifer. The symbols are important, as long as we keep them in their place. Your words are grace. I don’t think it was any coincidence that you found that ring yesterday, right? God-Incident for sure. This reminds me of the time I lost my wedding ring and FOUND IT in a snowbank – remember that story? God knew then, too, that was the exact moment I needed to find that ring. Agreed. Yes. Thank you, Michelle. No coincidence at all. Drop me the link to the wedding ring post, if you have a moment. i love that you found it. And i love how you paid attention and got a message just for you. God is like that when we listen, isn’t he? That is a wonderful story, and I’m so glad you found it again. Praise the Lord! OH Jennifer! What a beautiful, God-amazing story. I am so happy for you. I know what it is like to lose something so precious–a symbol, yes, but nonetheless valuable for what it represents. I lost my engagement ring (to be honest, I think it was stolen), and never got it back. But seventeen years after we were married, Mike surprised me with another, and I surprised him with news that I was pregnant! A couple years ago, when I came home from church, I realized my beautiful butterfly necklace (that he gave me for my “butterfly birthday”), was not suspended from my neck. It’s gorgeous (with tiny diamonds, rubies, emeralds, and sapphires). And yes, while a piece of nice jewelry, I was so sad because my beloved had surprised me with it, and it represented what I felt in turning a certain age, leaving the drab chrysalis of youth, spreading colorfully mature wings and flying! We went back to the church and began retracing our steps. It was like looking for a needle in the proverbial haystack. And finally going back to our car, on the sidewalk (tucked amidst autumn leaves, whose color and padding could surely have obscured it), Michael saw the glinting gems. God returned it to me. And it was now a gift not just from Mike, but from Him. I so get this, Jen. I am just so happy for His faithfulness in returning something so precious to you, and just lavishing you with His grace!–pure grace!!!!!!!! Yes Praise Him, He is still the same and cares about the little things that matter to us. Yay!!! The ring!!! How awesome! My $32 ring says the way, the truth, the life in Hebrew. I know what you mean about the symbols. I cried because it’s where I am and yet I know, that I know, that I know God is trustworthy and faithful. And as you’ve already said, “His promise is still good. Yahweh is still unreasonably good. And He never, ever leaves us.” Oh Yes and AMEN!! WooHoo!!!! Yes, I saw it coming, but I was still excited for you! And your girls looking at you cross-wised wondering what was up? Which one of them gets the ring?! LOL! I accept that some of the things we lose are never found again on this earth, but I was so glad to read that you found your ring. I lost my wedding band while gardening a few months before I lost my husband, who had placed it on my hand thirteen years earlier. When I sold that house, I told the new owner of my lost ring, and he arrived on my porch one day with my gold band. He’d found it in the asparagus. Why did I lose the ring, and why was it found again? I don’t know. One of the major things I learned from my husband’s death was to be content with mystery and unanswered whys and to simply rest in what I do know of God’s love. Most days I can believe and hold onto God’s goodness with faith only, but sometimes I need the ring. I’m so happy that yours is back on your hand. How incredibly beautiful. Thank you so much for sharing. Leave all your worries with Him, because He cares for you. Yeah! Doing a happy dance for you because I know how that feels. The loss of something that was significant and symbolistic, something that imprinted itself on your heart because of what it implied not because if its tangible worth. This is an encouragement of hope buildng, Jennifer. I needed to read your words, today… your loss and hurt coupled with the resignation to believe in the midst of it and of course the beautiful way He orchestrates the rescue. Thank you for all you share. You really ARE a rocking storyteller, Jennifer. Thanks for sharing this and hosting the link up. You are doing SUCH a great work here. PS: I am looking forward to reading Love Idol… Again. 🙂 I reorganized my bookshelf on Sunday and made sure that it is front and center at eye level so I can um, properly recommend it to anyone who comes over. This happened to me. Sort of. A diamond stud earring lost while sledding. The first gift from my husband. Irreplaceable. We searched for months in the snow. Knowing that once it melted, the golf course would be mowed and bye bye diamond forever. Finally, about three months later, my husband and father-in-law were scanning the same few square inches AGAIN and they found first the back, then the earring! Tears of joy. Symbolism is very real. Thanks for the story. Oh, I was so happening this was where your story was going! 🙂 So happy you found your ring, Jennifer. Loved reading this story! It brought back sweet memories of my own “ring” story. As a young bride-to-be my diamond engagement ring slipped off my finger one day without me realizing it. I wasn’t used to wearing it and had not had it properly sized yet and experienced that same dreaded feeling of realizing it was gone after washing my hands. We did take the sink apart and retraced my steps to no avail. I was a sad bride-to-be, but my husband-to-be showed he was the prince I had valued him to be when he shrugged his shoulders and said, “It’s just a ring. I’ll buy you another one just like it. Don’t worry.” His response on that day to me when I was so upset and crying was a treasure. A couple of married years later, I received a surprising phone call from my mom who informed me that a shining sparkle caught her eye one day when she was out in the back yard. She went over to investigate and my ring is what she found. Apparently recent rains had caused the ring to surface. WOW was all I could say and for years (before I received a whole new set for my 10th wedding anniversary) I wore both of those diamonds on my hand to remind me of our story. Again, thank you for sharing and reminding me of sweet memories. I need to leave a comment, but to be honest this had such an affect on me that I need to be quiet and let the Lord pour over me. Thanks for writing…I was so blessed.